Animefringe table of contents in your e-mail every month! Comments: The latest resurrection of the all time favorite Sega game series. 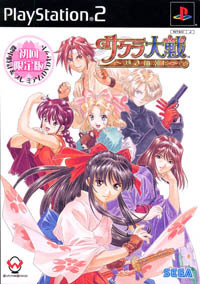 Sure as daylight, undoubtedly most otakus have heard just about enough about the old story of Sakura Taisen (ST) by now. After all, the game franchise had been around even before some of the newer otakus discovered the world of anime. Seeing some great potential that can be tapped, Sega and Red Company made a gamble and answered a request made by many PlayStation2 owners over the years -- to finally port the game series onto the PlayStation2 game console. However, unlike the previous remakes of the ST games on Dreamcast, the resurrected ST game on PS2 was given a much needed and surprisingly grand overhaul, from side quests, graphics, anime sequences and battle systems, to brand new never-before-seen scenarios, turning the reborn ST game into one of the most anticipated games so far in 2003 across Japan. As great as the game itself is, one of the main points of the new ST game is the premium DVD that comes with the limited edition box. This disc contains a detailed account of how the ST series first got started in early 1990s, as well as interesting bits of info, such as the original name of the leading female character -- it wasn't "Shinguji Sakura" but "Shinguji Sumire". There are some cheesy yet entertaining re-enactments of events, as well as a short but joyous news brief sparked by a short Q&A between a reporter and the executive producer of the ST game series - Hiroii Ouji, that in fact a Sakura Taisen 5 is currently in the works. He also hinted that Lachette, the leading beauty from the ST movie released several months ago, will be featured in ST5. The story itself will focus on the strike force, a counter-part of the Imperial Strike Force in Japan and the Paris group, based in New York City. Although few other details about the game were given because of the need for secrecy, the news came as a pleasant surprise for most ST fans who had been following the franchise since the beginning. Packaged with the limited edition Sakura Taisen: Atsuki Chioni, in addition to the premium DVD, is a pocket watch, the same as the one given to Oogami Ichiro in the game by his commanding officer, Yoneda, the drunken manager of the Imperial Theatre, plus a picture frame with portraits of all the female characters. Noticeable improvements include: upgraded anime sequences, featuring completely new anime art fused with CG graphics, digitally remastered anime sequences from the original ST game, and a new 'trust level' system. This allows the player to influence the reaction of not just the six leading female characters, but all others, including the female staff working at the Imperial Theatre. The result sometimes triggers some very interesting incidents and side quests with these female characters that were never introduced in the original versions on Sega Saturn or Dreamcast systems. Based on the solid foundation of the battle system developed for the ST chapters introduced on the Dreamcast console, Sega and Red Company, in cooperation with Overworks, were able to create that sense of freedom and intensity rarely seen in other games, using the freestyle combat system. With the original storyline as a base, every aspect of the original game has been improved and reworked. Instead of the traditional 'trial and error' method of hidden encounter events, most of the encounter events and side quests are now clearly marked on the game map. Details such as the level of urgency, type of event, the emotional state of the involved character(s) and level of emotional effects are shown. Rest assured, surprises are still lurking at every turn; countless random and scripted events are still integrated into various parts of the game, both old and new. In order to breathe new life into the game, a new character designer was entrusted with the task of redrawing all character artwork, from promotional art and character artwork used in the game to anime sequences. For anybody who has never had the pleasure of playing the ST game series before, now is the time to start. With two additional episodes developed exclusively for the PS2 version of ST, on top of additional sequences that link up with the up-coming ST5, Sakura Taisen: Atsuki Chioni is a solid buy. Well worth the money -- both as a game, and as a collector's item, with the limited edition extras.